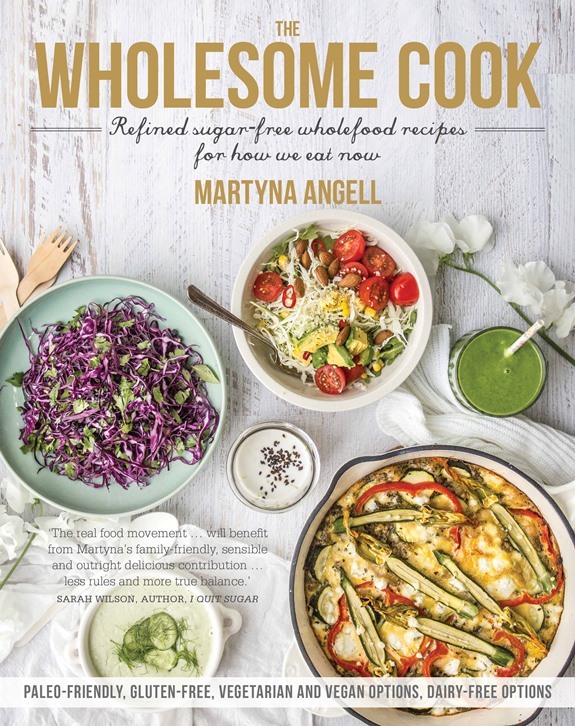 AS FEATURED: In The Wholesome Cook book (Harlequin, October 2015), now even more paleo with a Cauliflower ‘Bechamel’ Sauce and with the option of being cheese-free, as well as vegetarian or vegan. 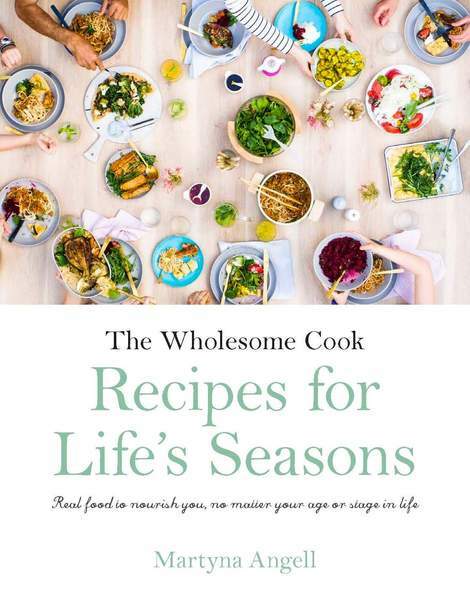 The 170+ recipes are all about eating the best food for your body. Food cravings. I have them all the time. If my body is lacking a nutrient I will almost immediately crave certain foods: pickles, yoghurt, tomatoes, hot oats, blueberries, bananas, hazelnut gelato… you name it, I’ll crave it. Recently, however, I have been experiencing an unusual opposite, the anti-craving. I’ve been madly avoiding pasta and happily going without. I’m just hoping this is not a way of my body telling me I’m allergic to gluten because I love my bread and I’m certain that will never change. So, to satisfy my new anti-craving, I made a gorgeous spicy arrabiata sauce the other night, packed with vegetables, shaved zucchini ribbons and no pasta… It was great and light and exactly what I needed. Maybe it’s a springtime thing? Who knows! Anyway, when it came to making this pasta-less lasagna, I was only happy to give it a go – extra serves of veggies never hurt anyone. And it was a great and tasty way to get the kids to eat those less popular vegetables too. Leftovers are great for lunch or frozen for another night. You will have to season the meat well, almost overseason actually, and make sure the sauce is cooked down as the vegetables will release juices into the dish while cooking. Spicy sauces, such as arrabiata work very well with this dish as the spicyness mellows out quite a lot in the mixture. To prepare the mince sauce: brown the mince and onion in a large pot, breaking up the meat into small granules. Add the spices, garlic, pepper, undrained corn kernels, canned tomatoes and arrabiata sauce. Stir all to combine and bring to a boil. Reduce heat to a simmer, and cook slowly stirring often for 20 minutes or until the sauce has thickened. In the meantime, prepare vegetables. To prepare the vegetable layers: wash all vegetables thoroughly. Dice capsicum and slice tomatoes. Using a mandolin or a potato peeler, peel zucchini and carrot into long ribbons. Slice eggplant into 3mm thin slices. Drizzle a large oven-proof baking dish with some olive oil. Arrange a layer of eggplant, followed by zucchini and carrot strips. Spread half the mince sauce over the top. Top with tomatoes and repeat the vegetable layers and mince layer again, using up all the vegetables this time. Sprinkle with some grated cheddar, mozarella or crumbled ricotta. Sprinkle with extra Italian herb and spice mix then bake in the preheated oven for about 25 minutes. Place under a hot grill for a further 3 minutes if using cheddar or other melting cheese if it hasn’t browned in the oven. To serve: serve slices of lasagna with your favourite salad greens. Freeze leftover single serve portions if need be and use within 2 months. Thanks Heidi, it’s a great idea isn’t it? This lasagna looks at least as appealing as the one with pasta. I would even say it’s more beautiful with the courgette’s lovely green! I must say if I didn’t do this for health’s and calorie’s sake, I would never exchange lasagna sheets for any vegetable. However, I often cheat myself and make half of the layers with courgette, my beloved vegetable. Your modification looks so good, I think I will try next time only with vegetables too! Thank you for the wonderful and creative idea! Thank you for visiting my blog! I am very happy to discover yours! This sounds so delicious. I love that you made it without pasta. Dont get me wrong I love a good pasta dish but sometimes its too heavy. I cannot wait to try this! Oh that looks wonderful. I was a bit skeptical at first. What do you mean no pasta? This just looks really tasty though! How very lovely that dish of deliciousness is. What a great alternative to using lasagne noodles. I really wish I could have a nice serving for lunch with the salad I brought today. That would make the most perfect meal on a very less-than-perfect Monday. Mondays are a pain. I know what you mean about cravings. Actually had ravioli for the first time last night in forever and am now craving more and more. Love the idea for the pasta-less lasagna. Looks fantastic! 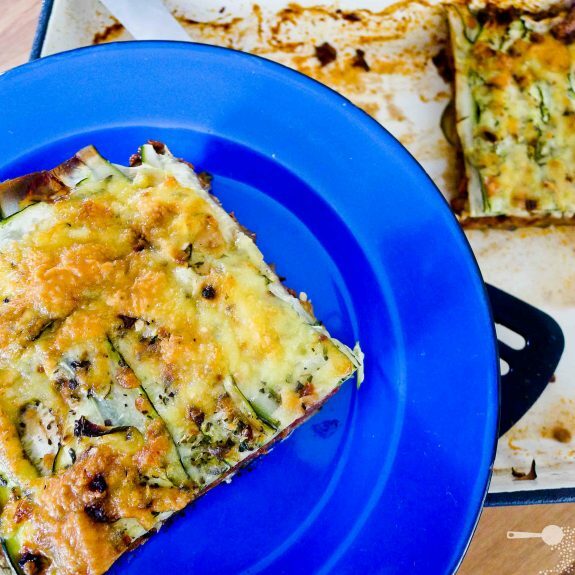 I’ve seen zucchini and eggplant used for “raw” lasagna, but I love the idea of baking it. Bookmarking this for a chilly winder evening! This looks really tasty, and quite simple. I’d imagine it’s still pretty filling despite the pasta…a good dinner option. Oh this pasta less lasagna looks absolutely delicious. I love how you made this. Thanks for sharing this recipe with us. This is a great idea, and it looks so pretty! i’m worried that my daughter may have a gluten allergy….. Substituting zucchini for the pasta is pure brilliance. Perfect for those watching their weight and trying to cut down on carbs. Wow… this is one beautiful lasagna and I’m already in love. I have never made lasagna before (it looks difficult?? Not sure since I’ve never made it before haha), but I feel like this one is easy…I hope! I’m bookmarking this to try. Thanks for sharing this beautiful and delicious recipe! Well this is just marvelous, here I was thinking of what I could make for dinner for a coeliac friend and BAM. Pasta-less lasagna. Genius! Gorgeous lasagna! I too try to stay away from too much pasta…and this is coming from an Italian!! But with this mix of flavors I know I won’t be missing the pasta at all!! Okay, this is GENIUS. I’m in love with this. I’m scared of mandolins (that’s why I haven’t bought one) but I might be able to get away with using my vegetable peeler. I am on a very low carb diet simply because I don’t like carbs unless for certain dishes like my fave pho. Love the idea for a pasta-less lasagna! I’m going carb free for the next several weeks – will add this recipe to my arsenal. Thanks! yum, I make lasange like this or with gluten free homemade crepes, it’s alot easier and quicker than waiting for the gluten free pasta sheets to cook! Nom nom nom…. Loving all your recipes. Hi … I was wondering what size baking dish was used ..
Hi Sadia, just a regular lasagne dish – 20x30cm approximately.